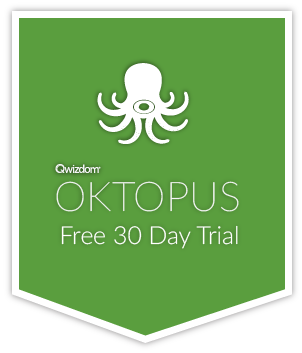 When Oktopus opens, a new lesson file is automatically created. To create a new lesson at any point, select ‘File’, and choose ‘New’ from the dropdown. 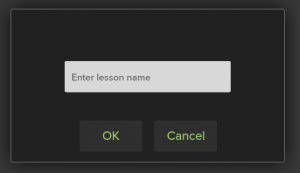 A prompt will appear on-screen asking for the entry of a lesson name. Type a name for the lesson and select ‘OK’. The name can be changed later from the Slide Management tab. ‘Open’ will open an existing lesson. A file explorer window will appear to find and select the required lesson. Oktopus can open .wtzx file and can import *.iwb, and *.notebook files. ‘Open Recent’ shows the last 10 opened files. ‘Save’ will prompt for a save location and name the first time it is used for a new lesson. It will over-write existing lessons without prompting. ‘Save As PDF’ will prompt for a save location and name, and will export the entire lesson to a PDF document. ‘Print’ will send the lesson slides to a printer. Qwizdom OKTOPUS can import native .notebook files from Smart Notebook and .iwb files from Promethean ActiveInspire and Smart Notebook. IWB files from other applications may also work but are not currently supported. Please contact us at our support center if you are having problems when importing and attach the file for testing.